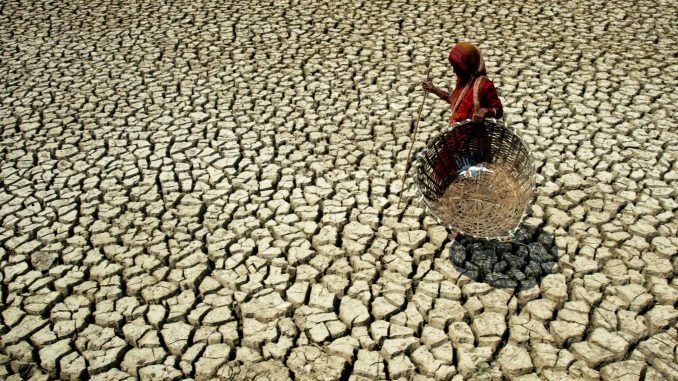 India’s farmers are already feeling the effects of climate change, and agricultural output will suffer further as rainfall becomes more and more erratic, a government report has predicted. The annual economic survey, published by India’s finance ministry on Monday, said changes in climate could shrink agricultural income by as much as 25 per cent in unirrigated farmland and 18 per cent in irrigated areas within the next 82 years. But even these figures might underestimate the true impact of climate change, said the survey, which was overseen by prime minister Narendra Modi’s chief economic adviser, Arvind Subramanian. “These are stark findings, given the already low levels of incomes in agriculture in India,” it added. Farming was once the backbone of the Indian economy, contributing 52 per cent of India’s GDP in 1950. Although that share has dropped steadily over the years, down to around 14 per cent today, a huge proportion of the population still depends on agriculture for its livelihood. According to data from India’s 2011 census, roughly 263 million Indians — around 22 per cent of the population — work in the sector, either as farmers or as agricultural labourers. Among them is Aruna Urs, whose family has been farming land near the city of Mysore, in the state of Karnataka, for at least eight generations. In the summer, Mr Urs grows vegetables; after the monsoon has passed, in the final third of the year, he grows quinoa and chia. Summer temperatures are expected to rise further across the Indian subcontinent. If worldwide emissions do not decline, several parts of northern India will reach a fatal “wet-bulb” temperature of 35°C by the end of this century, according to research published by Massachusetts Institute of Technology scientists in August last year. A so-called “wet-bulb” temperature factors humidity as well as heat into its calculations. At a wet-bulb temperature of 35°C, humans are unable to cool themselves through perspiration. The shifting climate has also made rainfall over India more irregular. And in a country where roughly 52 per cent of the farmland is unirrigated — in other words, dependent on seasonal rain to water its crops — this is a big problem. In times of heavy rain, crops are inundated or washed away; when rain is scarce, farmers resort to pumping more water out of the earth to water their crops, depleting groundwater resources as a result. With this in mind, the economic survey said that India must irrigate more of its farmland. “The challenge is that the spread of irrigation will have to occur against a backdrop of extreme groundwater depletion, especially in North India,” the survey said. Irrigation relies, in part, on conserving and carefully distributing groundwater. “India pumps more than twice as much groundwater as China or the United States,” it added. But many of India’s farmers are among the country’s poorest people, unable to afford the installation of irrigation systems. The average farm household earns 6,426 rupees (Dh371) a month, according to government data. The unpredictable rainfall also brings another challenge: disease, wrought by bacteria, viruses and insects. Last year, for instance, unusually heavy spells of rain in Karnataka triggered an outbreak of armyworm, an insect that feeds on paddy, maize and millets. Nearly half a million acres of crops were destroyed, the state’s agriculture minister said in December last year. As climate change further disturbs agricultural patterns, farmers will go into deeper distress. Since 1995, when the government started to keep relevant records, roughly 300,000 Indian farmers have committed suicide, unable to pay off their debts or improve their harvests. A study published last year by a researcher at the University of California, Berkeley, found a correlation between farmer suicides and spikes in temperature in India. “For temperatures above 20°C, a 1°C increase in a single day’s temperature causes [roughly] 70 suicides, on average,” the researcher, Tamma Carleton, said, estimating that at least 59,000 suicides since 1980 can be attributed to a warming climate. If agricultural families aren’t able to adapt to building temperatures, she added, “it’s likely we will see a rising number of lives lost to suicide as climate change worsens in India”. But it won’t just be farmers who suffer, said Mr Urs.